Straight from the camera–no photoshop! We’re both going to be taking a vacation for the next week and a half as my family from Michigan and Connecticut are coming to visit. We’re going to take them to Yosemite National Park and then Grand Canyon National Park. My parents love this country as much as their land of birth, Vietnam, and even named my youngest sister in Iraq, Tu Do, meaning Freedom. But because of work, they never experienced some of the natural wonders that make it so great. So Kim and I think it’s about time they get to see some of it. So unless they have wi-fi in Yosemite or Grand Canyon, we might not post for the next week or so..but since we’re in the full summer swing, we’re going to leave with a duet of posts on the essential summer fruit, watermelon. I had a big watermelon all to myself and for two days straight ate it as the main course…day 1, I stumbled upon this recipe from the Boston Globe where watermelon is roasted, morphing the texture and appearance into something almost resembling ahi tuna—considering the success of the grilled pineapples, the recipe seemed simple enough so I had to try it. Preheat oven at 350 degrees. In large roasting pan, oil a piece of parchment paper the size of the pan. Prep watermelon, removing rinds and seeds. Place the slices in the roasting pan. Pour the sherry over them and dot equally with butter. Sprinkle with salt, and very lightly with pepper. Cover the watermelon with the parchment paper, then cover the pan tightly with foil. Roast the slices for 2 1/2 hours or until charred around the edges. In the meantime bring to boil balsamic vinegar in saucepan and reduce in half. When done, remove watermelons. 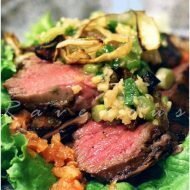 Serve with mint, cotija/feta cheese and drizzle balsamic reduction. Hong & Kim, I'm passing on the Kreativ Blogger award to you. Visit my blog and check it out. Love your blog! That's pretty darn cool. Could have fooled me! What is the texture like? ….. wow! How cool is that?! You're a lifesaver.. with this pregnancy I can't stand the look or taste of meat, so I've had to be creative to keep my husband happy with cheese, tofu and eggs.. now THIS is something new to try! Ellie: Your blog is AMAZING!!! Thank you so much for your kind comments!! Lauren: The texture was soft as if it was a fillet of fish. Knowing how juicy and crunchy a fresh watermelon slice is, you might think it's blasphemous to even try to roast it. This is something that some will like and some will hate…but everyone will be talk about it. Linda: Thanks and good luck with the baby!! 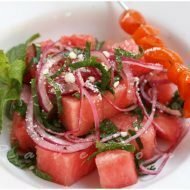 I've been going on and on lately about how delicious watermelon is in savory applications. This looks incredible! I have to try this roasting technique. Very cool! I think I have the perfect first course to serve with it: grapefruit crudo. 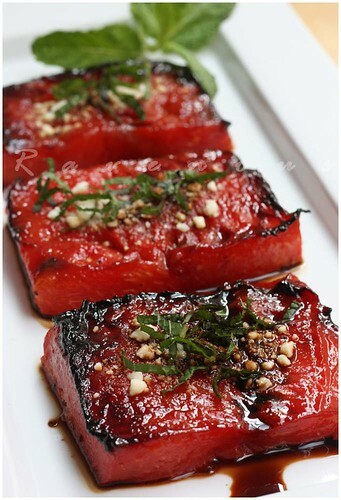 I wish I had a pro vacuum press to try compressing watermelon, I bet that would work well with your dish. lisa: You're absolutely right..watermelon is great in savory dishes. We had it with porkbelly once. creative use of fruit btw!! i could use either right now…mmm! beautiful picture! I so have to try this! jeannie: that's awesome. It'll be our first time. we don't plan on conquering anything… but we'll surely enjoy the views! 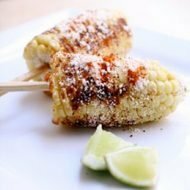 veggiebelly: Thank you! If you do, try it without any cheese or balsamic..maybe do the grapefuit crudo like michael suggested. I think it needed more acid. how gorgeous! Yes, I agree that they resembled nicely seared salmon. Love the bright red hue. What a clever recipe! This does look like steak/ahi tuna. It also looks delicious! 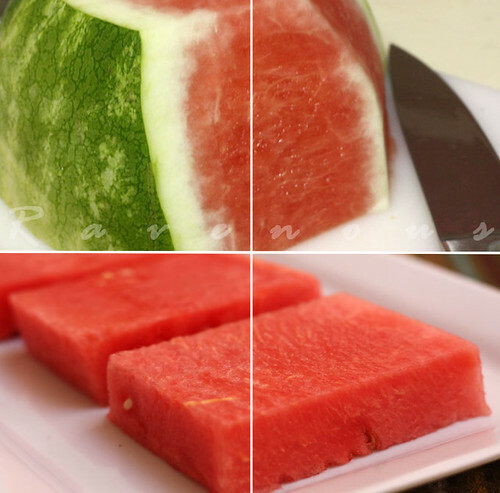 Check out our list of Top 10 Watermelon Recipes for more ideas for watermelon. i just tried it… but my final verdict was that… its not really my favorite either, and it's kind of a type of food you gotta be in the mood for, and a bite or two would have sufficed hehe… well, here's my pic! I love watermelon and when it is in this type then i can't control me. This looks really good. I hope you all are enjoying yourself at the National Parks. Hillary: Thank you for your suggestions! Hugh: Nice photos and thank you for sharing with us what you thought. We agree with you too. Laurance: Thank you for your comments and taking the time to read our blog. jude:yes, Marcel did something like this! Lori: Thank you! We sure did and have posted some pix in our bun thang recipe! While this is visually stimulating and is almost certainly delicious, it’s impractical. Waste in the form of energy. Running an oven for 2.5+ hours to roast some watermelon pieces…c’mon. I think a brûlée torch would give you the same effect at a fraction of the cost/time. Granted, it probably wouldn’t be as tasty at this recipe you’ve devised. I’ve had this prepared at 51 Lincoln, and it was this exact recipe that I went searching for to prepare for the friend with whom I shared it years ago. I loved it then, and hope it’s as good at home.